The rolling hillsides around Bordeaux are lined with vineyards where grapes including merlot, sauvignon blanc and sémillon flourish in the bright sunshine and mineral-rich soils. Here are a few ways to enjoy wine tasting and sightseeing in Bordeaux. Bordered by the Gironde Estuary and the Atlantic Ocean, the 62 square miles (100 square kilometers) surrounding Bordeaux are essentially one enormous vineyard—divided into 60 appellations and some 8,500 different châteaux. North of the city of Bordeaux, the Médoc wine region is celebrated for well-balanced reds from appellations such as Margaux and Pauillac. From the southern Graves region, grape varietals including muscadelle, sauvignon blanc, and sémillon combine to produce popular sweet whites such as Sauternes. Elsewhere, the Gironde department produces fine varietals including cabernet franc and petit verdot, while the eastern regions of Saint-Émilion and Pomerol are famous for aged Petrus wines—in which merlot is the key grape varietal. Take a wine tasting and château tour to the Pomerol and Saint-Émilion regions, where you’ll see the sights, and learn what makes Bordeaux wine so special. Hop into the saddle on a bicycle and foot tour of the vineyards, and cycle to some of the grand cru châteaux for which Bordeaux is famous. Visit local Bordeaux bakeries, cheese shops, and chocolatiers on a foodie’s walking tour, and finish with a tasting of fine wines. Delve into the Médoc region to master the art of pairing food with wine, and get insight into the enduring popularity of French wines. Spend an afternoon wine tasting in the French countryside in one of two famous wine regions – St-Emilion or Medoc – during a tour from Bordeaux. On this 5.5-hour tour, stop at two charming châteaux to sample the local wines. Nibble on French cheese and cured meats with fresh bread as you sip. Cap off the small-group tour with a mini-class, during which you'll learn some wine-tasting tips from an expert. Discover the rich wine-making traditions of St-Emilion on a guided tasting tour from Bordeaux. With a group of fellow wine enthusiasts, spend roughly 9-hours visiting two distinguished wine estates in this UNESCO-listed territory to sample and learn about exquisite local varietals. Your excursion includes fascinating estate tours, informative tasting sessions, a buffet lunch and independent time to explore the charming town of St-Emilion and its underground monuments as the church and the hermitage. Pleasure your palate with the rich flavor and smooth taste of wine grown exclusively in the Graves region on a tour from Bordeaux. 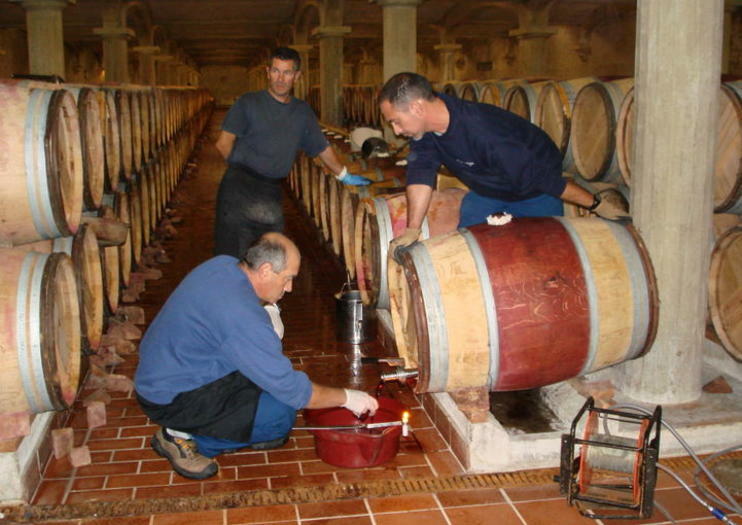 With a connoisseur guide, visit two of the area’s most impressive chateaux and uncover the secrets behind ancient winemaking processes. Gaze at picturesque sprawls of vineyards and descend into the cellars of established wineries to taste refined samples of wine produced on the properties. Learn which wines compliment which foods and educate your palate in the complex flavors present in each sample. Combine two of the most popular Bordeaux excursions into one full-day including magnificent châteaux, picturesque vineyards, wine tasting and fresh oysters in the Bay of Arcachon and Médoc wine region. With this Bordeaux Super Saver, you'll experience the best of the region in one day at a discount. Group size is limited to eight people, ensuring more personalized attention from your guide. While in Bordeaux, discover the bounty of wine country on a full-day guided tasting tour! With an expert guide, tour a wine cellar in Bordeaux’s historic district and enjoy a tasting before stopping in town for a traditional lunch. Then depart Bordeaux to explore outlying wine chateaux in either Medoc or Saint Emilion. You’ll visit one or two esteemed wine estates, meet local vintners, learn about the extraordinary local viticulture traditions and sample a range of fine wines. Experience the fine wines and rich culinary culture of Bordeaux on a full-day food tour of the rich winemaking region. With an expert gastronomic guide, visit three esteemed wine estates and feast upon a lunch of local specialties at an acclaimed restaurant. Gaze at the picturesque vineyards of the Margaux wine region; take a tour of the cellars and vat rooms of three Margaux chateaux; and enjoy the convenience of round-trip transportation from Bordeaux in an air-conditioned coach. Sample some of the best of the French wine world with a full-day wine tour of the fabled Médoc region from Bordeaux. With an expert guide, visit three châteaux for wine tastings where you'll sip firsthand the wines giving this region its worldwide reputation since the 1855 Bordeaux classification. Learn about the appellations and classification system for wine, get insider tips on pairing food with wine, find out how to decode a French wine label and more. At the second château of the day, dig into a traditional French lunch.